A deliciously light, Thai influenced tender and moist grilled chicken. You will love the light and healthy flavors infused in this chicken. 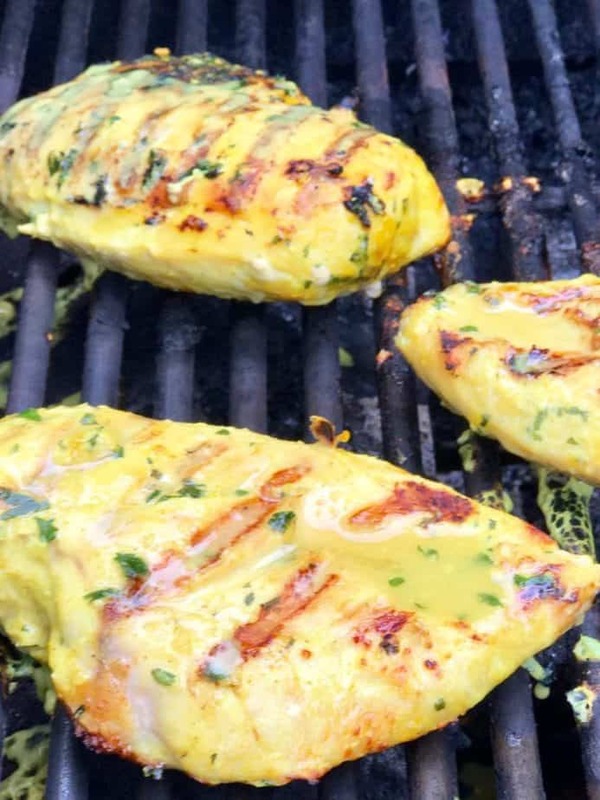 Make the marinade and toss in your chicken, freezing for a quick and simple last-minute dinner! 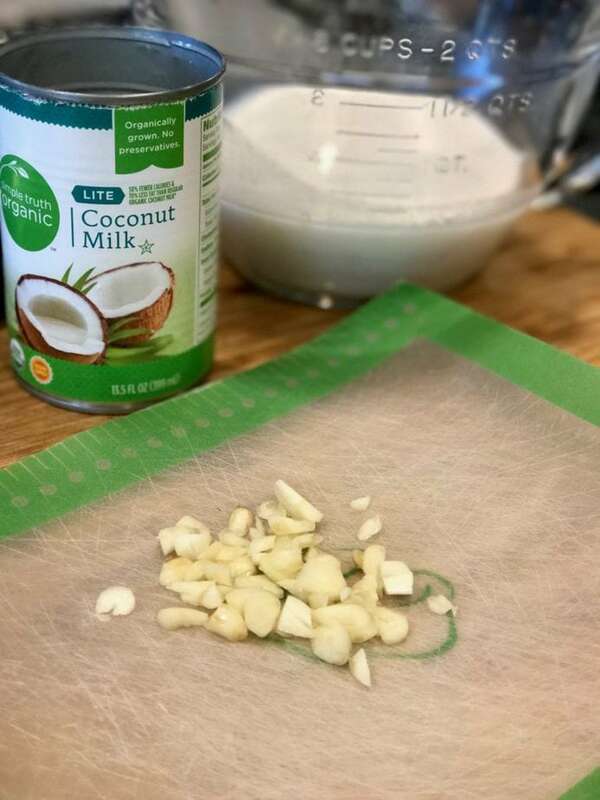 Begin by pouring in a can of your favorite coconut milk, light or full fat, though I prefer the full fat (but this is what I had on hand), and toss in your rough chopped garlic. Next add your brown sugar and salt. 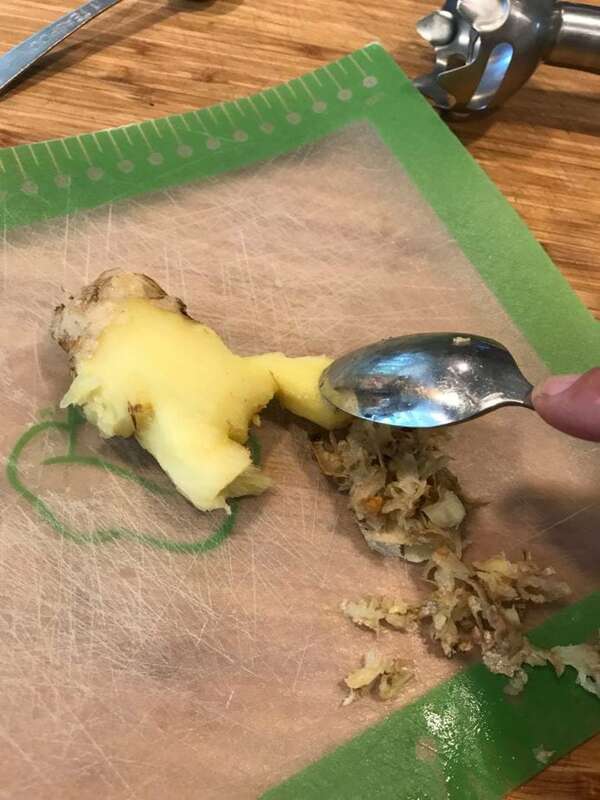 Then add your freshly grated ginger, no need to peel the ginger, simply use a spoon and gently scrape off the “skin”. Then grate using a grater or microplane. 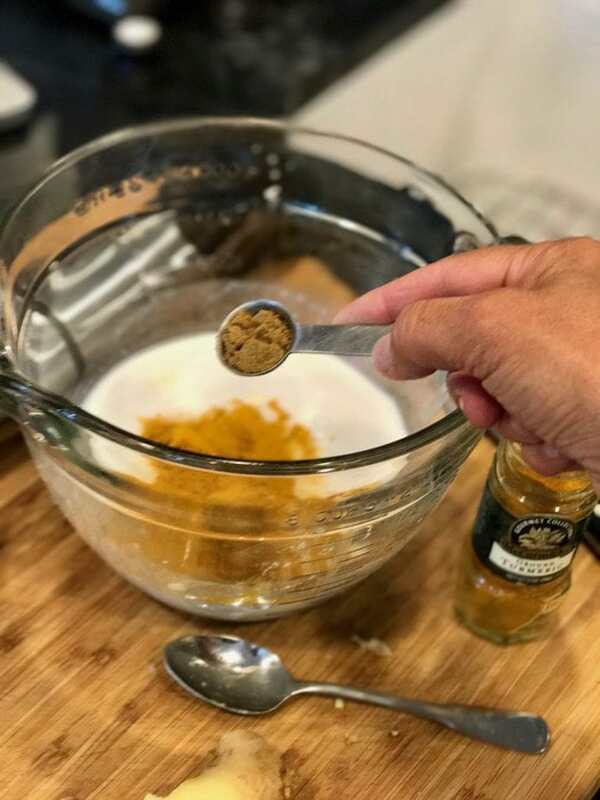 TIP: Freeze the leftover ginger root, removing and slicing off what you need for recipes or grating straight from frozen. Next add your turmeric – I always feel like I’m mumbling when I say it. A wonderful anti-inflammatory and antioxidant! Plus your cumin, and coriander. I only had coriander seeds, so used a few and just placed in the coconut milk mixture. 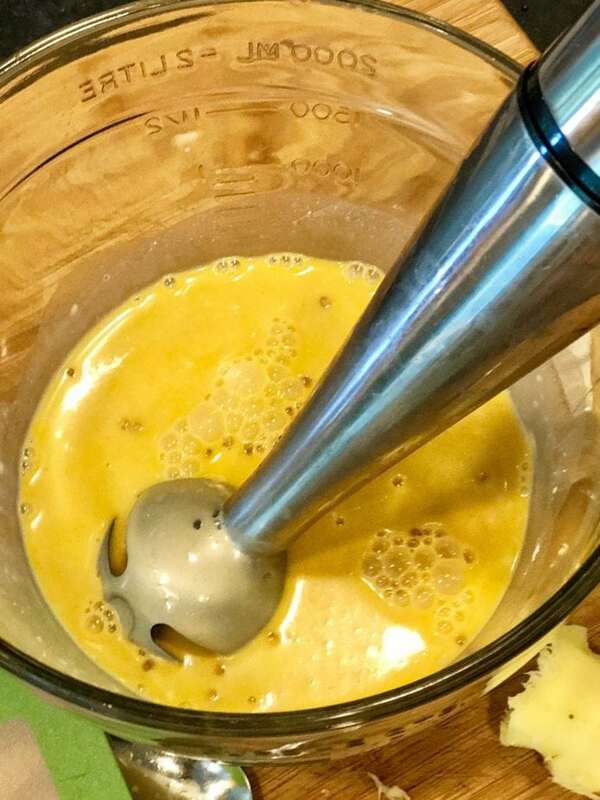 Next, if you have one, blend using an immersion blender, or place in regular blender and blend until combined. Add your fresh chopped cilantro and blend again for just a few pulses. 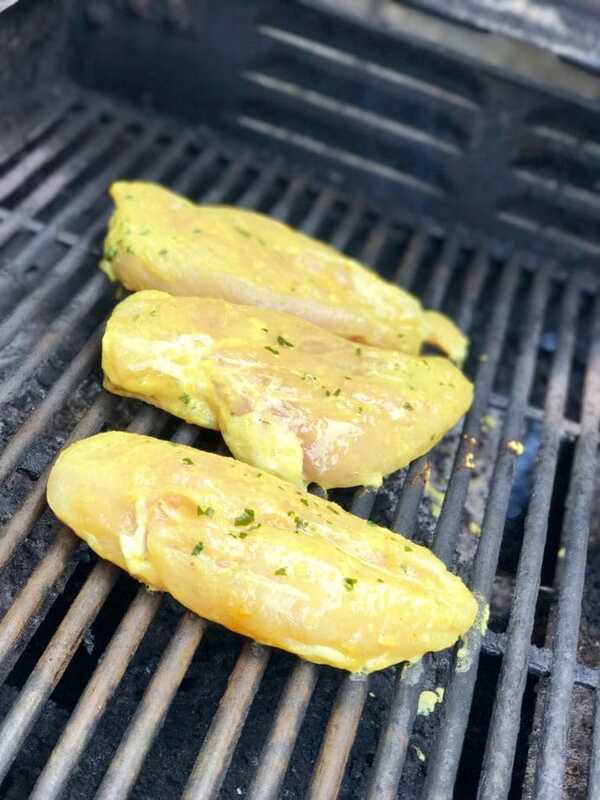 If freezing meals, be sure to write on the freezer baggie the name of the meal ahead of time, this marinade is easily split into two servings of about 1 cup each to cover approximately 8 chicken breasts. Once in baggie(s), squeeze out excess air and lay flat in freezer to freeze. If using immediately, allow to sit in marinade for 2 – 24 hours in refrigerator. If frozen, thaw in refrigerator overnight or on counter for 2 hours. Brush grill with oil, remove chicken from marinade and place on grill. 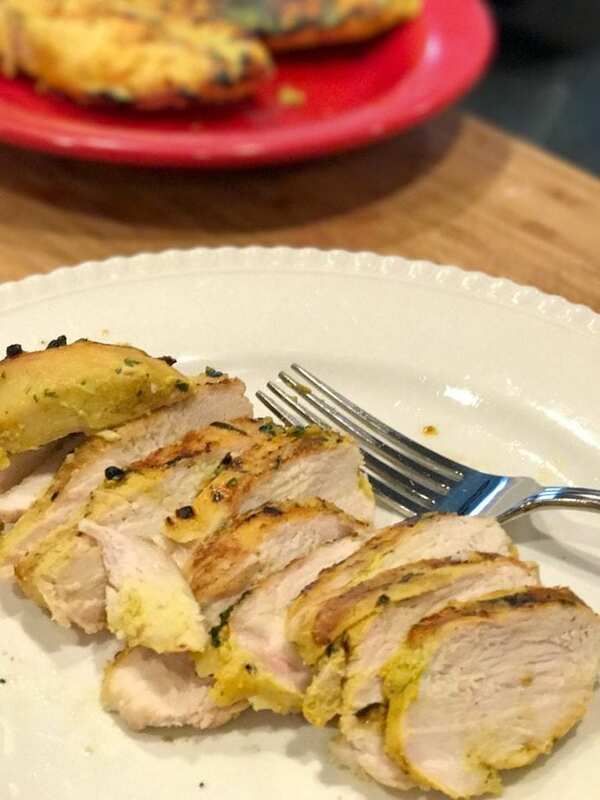 Grill chicken until cooked through about 6 minutes per side (depends on how thick the chicken is) for boneless chicken breasts, less time for chicken tenders (about 2-3 minutes per side) and a little more time (8-10 minutes) for chicken thighs. Baste using leftover marinade, discard any unused marinade or simmer in small pan over medium heat for 10 minutes or more. Pour thickened sauce over sliced chicken. Remove from grill and allow to rest covered about 5 minutes before serving. Serve whole or sliced. 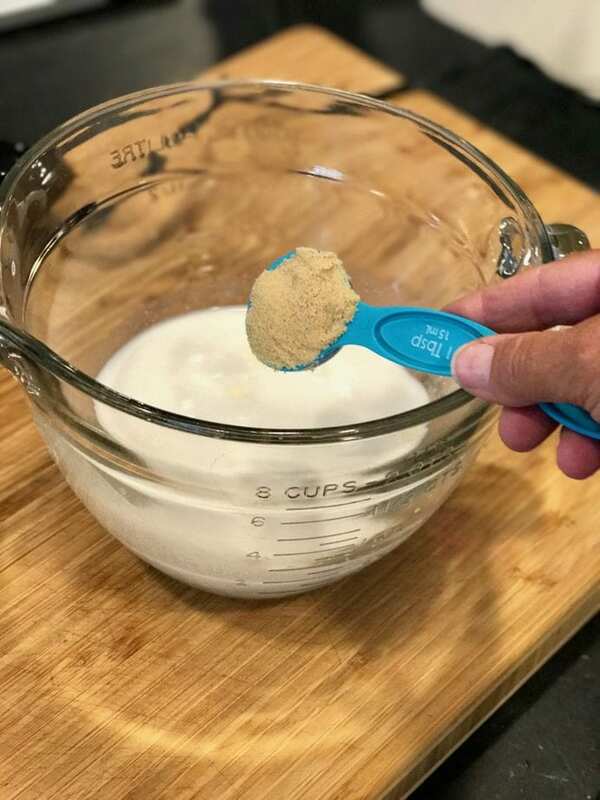 This recipe was inspired by a similar recipe from Mel’s Kitchen Cafe. 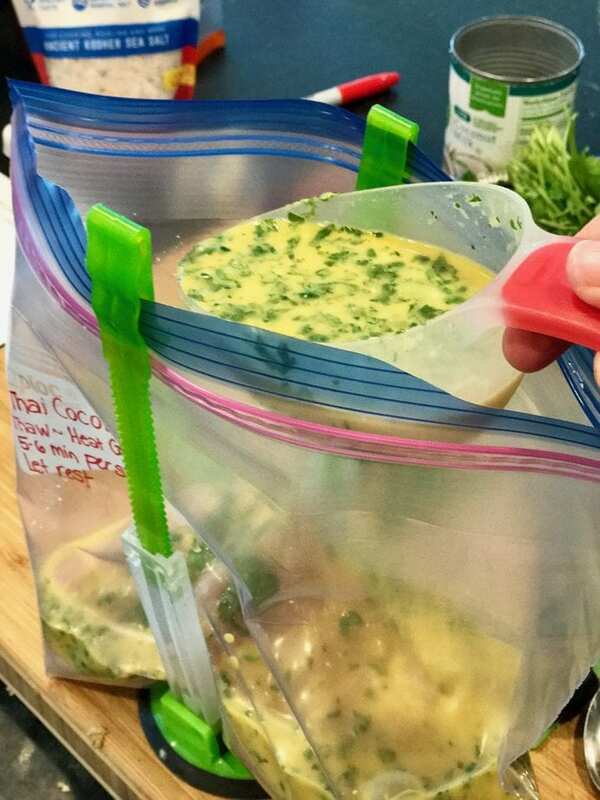 A delicious and healthy Thai inspired coconut milk chicken marinade. Comes together quickly for an easy any-time meal. Freezer friendly. 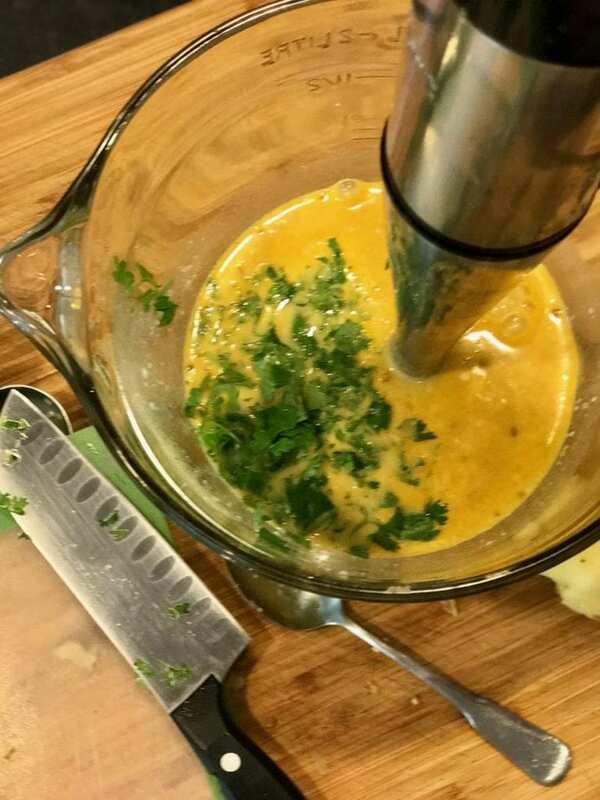 In a medium bowl whisk together the coconut milk, garlic, brown sugar, salt, ginger, turmeric, cumin, and coriander. Using an immersion blender or regular blender, blend marinade ingredients for a few pulses. Add cilantro and pulse again a couple of times. Write the name of the item on the outside of a gallon sized freezer bag, place in stable container to pour in marinade. Separate into two bags if desired with 4 chicken breasts per baggie. Pour in half of the marinade (about 1 cup each). Squeeze all air out of the baggie and seal. If freezing, place flat in freezer until frozen completely. If using immediately, allow to marinade for 2 – 24 hours before grilling. Refrigerate during marinating. If frozen, when ready to use, remove from freezer and thaw in refrigerator overnight or on counter for 2 hours. Heat grill to medium-high heat, brush with oil. Basting using leftover marinade, discard any unused marinade or bring to simmer on stovetop for 10 minutes to kill any bacteria and serve over chicken. If desired, squeeze a fresh lime and serve. Copyright 2017 | This recipe for Thai Coconut Grilled Chicken was featured first on The Fresh Cooky.